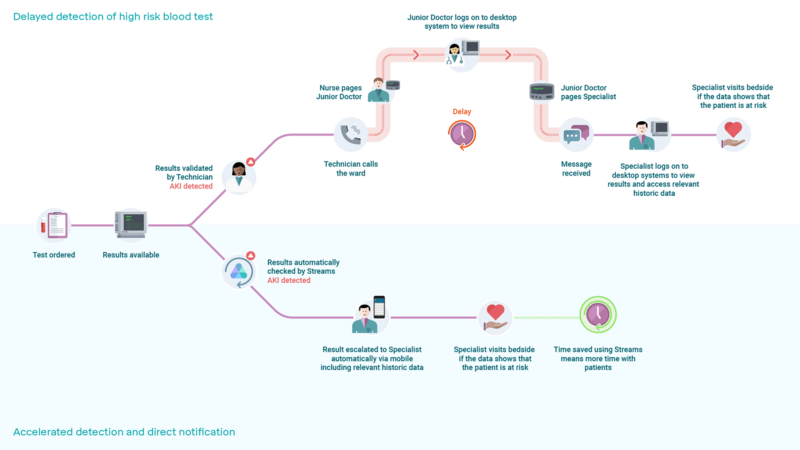 In 2016, DeepMind announced that they would work on 1.6m patient records from the Royal Free NHS Trust in London. The media reacted mostly with suspicion and outrage. Soon after, they came out with the life saving Streams App which tackled Acute Kidney Infection (AKI). To get you up to speed, AKI is linked to 100k deaths in the UK every year and the NHS spends an estimated £1bn on it. They are very clear on how to diagnose it, they've even published their algorithm for all to see. So if we already have an algorithm, why are humans still doing this boring work? Streams is no magical AI, just the algorithm above. It’s arguable that most of the value comes from the system’s design, which removes a long, expensive, human, chain of chinese whispers (as shown in the image below). It’s almost disappointingly simple. So how did Streams do? In short, really well. Nurses reported a saving of 2 hours a day. Patients were referred to life-saving treatments more quickly. Last month the audit of the streams app was released. No sensitive data has been leaked, yet (touch wood); and the data has not been used for any nefarious ends. Streams was a good start, and we can now all see how a well designed system can reduce healthcare burden while improving care. But AKI is a drop in the ocean. Building expert systems to tackle each disease separately is likely to cost more than it saves. Fortunately, the research community is giving us the tools to do this efficiently (see “Machines Reading Patient Records”). I wait for the next iteration with bated breath.